I have started stitching a stocking for my first grandchild, a boy named Ellis. The stocking is from Rebecca Wood Designs and is called Bad Landing. It cracks me up and I think he will love it as a child and as an adult. 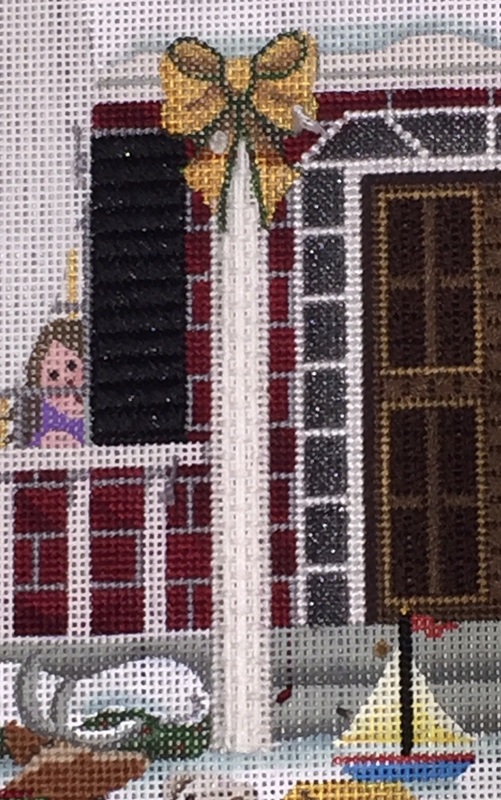 This is the stitch I used for the porch columns. I used Pebbly Perle, a thread that is sadly discontinued. I used the thread “as is” for the burden part of the stitch and then used 2 strands of Pebbly Perle for the two vertical lines on each side. In place of Pebbly Perle you could use Trebizond or Rainbow Linen, depending on the texture you want. I think the stitch would be fine without making the two sides thinner, but you could use a stranded silk that matches the burden section. Honey, I shrunk the snowflakes! I love a stitch that Robin King diagrammed for, I believe, Teri Ambriz. I was looking for a background stitch for the sky behind the Claus Residence. Robin and Teri's version was too large for the scale of the canvas, so I shrank it. The thread is a Petite Silk Lame and the circles in the diagram represent Swarovski hot fix crystals, size 6ss. One stocking down, 2 to go for this year. Love this stocking by Susan Roberts. Three stockings in one year will be a new record for me. Pressure's on! We're ready for the Royal Wedding...are you? My second big finish of the year--too much fun! Some of my favorite things--Painter's Thread single loop trim, Swarowski crystals and raiding my growing bead stash. This is my first big finish of the year, just back from my framer. I'll have the stitch guide ready for sale May 15. I love this piece! Canvas by Kelly Clark. A great stitch for snow! This tip comes from Meredith Willett. She had me unravel white Snow by the Caron Collection and then use it for the Nobuko stitch. It lets just the right amount of shading to show through. My first finish of 2018! 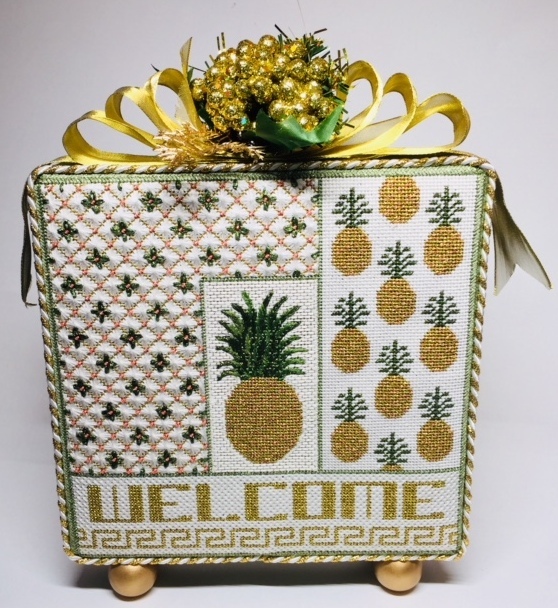 The canvas is by Strictly Christmas; the stitch guide by June McKnight, with changes by me. Finishing--just in time for the holidays! Boxes of finishing are arriving almost daily. Here are some of the latest. 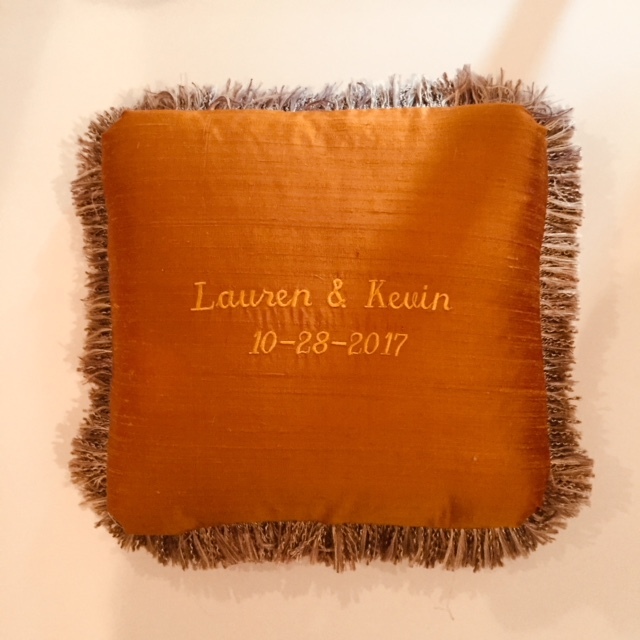 This pillow just came back from the finisher--such an elegant wedding gift! I couldn't resist this canvas by Kelly Clark--I bought one for my very own stash. I am treating myself to a seat in Julia Snyder's embellishment class next month and this is my canvas. It just makes me happy. You can get one for yourself, too. Check out Kelly Clark canvases on our website. This is the very top of a Melissa Shirley Halloween cake--I call her Glam Girl. I used Fuzzy Stuff for her eyelashes. I cut a stitching length and then ran the thread between my fingers to fluff up the fuzzy stuff. My first stitches sank into the pumpkin, so I stitched over them. Too much makeup! I ripped that out and stitched with one strand again, but this time I used a laying tool to help the thread float on top of the other stitches. I then used the laying tool to tease out the fuzz. Ready for her photo shoot! The Easiest Turkey Work Ever! If you can stitch basketweave, you can stitch Cut Turkey Work. Sally at Rainbow Gallery taught me this trick--she was taught by Susan Portra. Use a long length of thread--Glisten by Rainbow Gallery makes a wonderful cut turkey work thread. Go down from the front of the canvas, leaving a tail. Stitch basketweave, leaving loops on the front for the canvas. This photo shows the start of the stitch at the top. The lower right shows a partially worked area. Hold the loops out of the way as you stitch. When you have stitched the area, cut the loops and trim carefully. Trimmed Turkey Work at the top, untrimmed lower right. Never fear Turkey Work again! In teaching my pilot class for the Old Fashioned Christmas tree and writing the stitch guide, I inadvertently created a better stitch for one of the ornaments. I stitched this gold band topped with messy beading. I drew this for the stitch guide. My students followed the diagram and the band looks great. So, I ripped out sections of the bargello and this is what it looks like now. A happy mistake! Just received these wonderful finished pieces--so much fun! Here are my most recent 3 finishes--now I get to pick one new one to start. Don't know the 3-2-1 rule? Pick 3 unfinished canvases and finish them Your reward is getting to pick one new canvas to start. Then pick 2 unfinished canvases and finish them. Reward: pick one new canvas to start. Pick 1 unfinished project and pick a new one to start. Repeat. We'll see if I stick to this! It's so much fun opening boxes full of beautiful canvases. From Ann Wheat Pace, floral hearts to put you in the mood for Spring. I see visions of ribbons and raised work. I collect boxes of all kinds--Russian, Japanese lacquer, wooden (carved or shaped), porcelain and needlepoint. I love Funda Scully's hinged boxes! It's so easy to finish stitching something you love! The canvas came with a stitch guide; I made a few changes. I found the perfect stitch and thread for Karyn's Peep. I used the brick stitch and Straw Silk in Bubble Gum. I will use 7mm ribbon for the flower petals, messy beads in the center, Boucle' for the grass. I'm in an Easter frame of mind. Julia Snyder will be back at the Bristly Thistle this November 13 through 18. The first three days will be a project class--the Knotty Bouquet. November 16, 17 and 18 will be Embellishment with Julia. Come join us on the island!